Whatever store Dean found that sold his beloved “brown label” (most likely Cardhartt) shirts – he bought multiple colours. This shirt is much like Dean’s S4 Green shirt, only it’s blue. The buttons are a visible light brown. It has one breast pocket on the left that has no flap, just a small brown label. In Yellow Fever (4x06), Dean wears it when he is waiting in the motel room for Sam to save him, and the sheriff attacks and then he hallucinates Lilith. In The Monster At The End Of This Book (4x18), Dean wears it to Chuck’s house when Chuck has the vision about Lilith. He keeps it on for the rest of the episode. 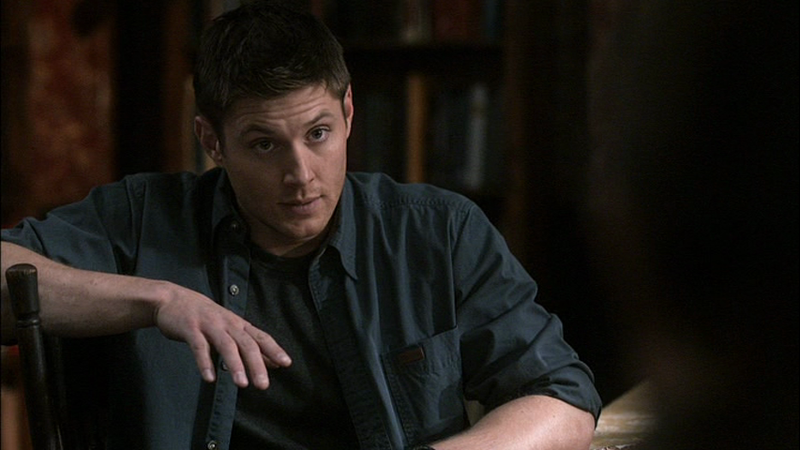 Dean wears this shirt for the entirety of Dead Men Don’t Wear Plaid (5x15). In 99 Problems (5x17), Dean wears this shirt to the kid’s funeral (Dylan), but changes out of it before they recruit the minister to help them kill the Whore of Babylon. In Weekend at Bobby’s (6x04), Dean is wearing it when Bobby calls him to tell him that the creature Dean and Sam are hunting is a Lamia. Dean keeps it on for the rest of his appearances in the episode. In All Dogs Go To Heaven (6x08), Dean puts on this shirt while Sam is staking out Lucky’s house. He wears it until they shoot all the Skinwalkers. In Like A Virgin (6x11), Dean wears this shirt when he and Sam get back from interviewing the girl at the hospital, and Dean calls Bobby to find out what he knows about dragons. He then keeps wearing the shirt as he drives to San Francisco to see Dr. Visyak, and then comes back to check out the sewers with Sam. In Frontierland (6x18), Dean wears this at the beginning of the episode when they research in the Campbell library. In Adventures in Babysitting (7x11), Dean is wearing this shirt when he decides to go pay Frank a visit while Sam leaves to help Crissy. Dean wears the shirt until he and Crissy rescue Sam from the Vitalas. In Citizen Fang (8x09), Dean wears this shirt for the entire episode. In Devil May Care (9x02), Dean is wearing this shirt when he and Sam arrive at the Bunker with Crowley. He wears it until he and Sam have to put on suits to go investigate the incident on the Navy bus. In American Nightmare (12x04), this might be the shirt that Dean changes into after they visit the family, and Dean decides that the social worker must be a witch and goes off to confront her. He wears it for the rest of the episode. In In The Beginning (4x03), a young John Winchester wears this shirt at the end of the episode, when he is temporarily killed.